Boštjan Potokar (MFA, Project Finance Head Manager, Academic coordinator, Teacher) is the dean of the School of Arts of University of Nova Gorica. He is a renowned visual artist, exhibiting in diverse simposia and workshops, set designer (together with Rene Rusjan) and an awarded writer-author. Rene Rusjan (MFA, Curriculum Development Coordinator, Teacher) is a visual artist and programme director of the School of Arts, University of Nova Gorica and professor in Contemporary Art. As mentor of contextual projects, she initiated, mentored and co-organized numerous interdisciplinary projects in public space, as well as in galleries and other project sites. Tina Smrekar (MFA, Project Head Administrator) is coordinator of cultural and educational projects and visual artist. She holds an MFA in Photography from the Academy of Visual Arts in Leipzig. At the School of Arts she is responsible for project coordination and administration as also the school’s documentary photography and editing of the School's ePlatform. Nadija Mustapić (MA, MFA, Curriculum coordinator, Local Project Coordinator, Teacher) obtained her MA and MFA at the University of Iowa, School of Art and Art History. She is an Assistant Professor at the Applied Arts Academy at The University of Rijeka. Nadija Mustapić is an intermedia artist exhibiting in solo and group shows in Croatia and internationally. Her artistic practice includes collaborations and she is one of founding members of The Moving Crew art collective. Tomislav Brajnović (Assistant professor, Teacher) teaches New Media at the Applied Arts Academy, University of Rijeka. His approach to media is more content related and his intention is to relativize the importance of the media and to accentuate the mind set and artistic cognition as the determinative factors of art practice. Some od his interests include notions such as Performative image, Recontextualisation, Remediation, Redefinition, Translation, etc. He is founder of the Studio Golo Brdo project. Fedor Vučemilović (MFA, Curriculum coordinator, Teacher) is Assistant Professor of Photography at the Applied Arts Academy, University of Rijeka. His artistic work, started in the avantgarde “Grupa šestorice” (Group of Six), includes film, photography and video (short feature films, documentaries, reports, travel videos, photo-essays on other authors, promotional videos). Paula Trinajstić Ivančić (MA, Local Administrator, Researcher) administers international relations, Erasmus mobility, quality assurance, cooperation with local community and businesses. She graduated English and Croatian language and literature from the Faculty of Humanities and Social Sciences in Rijeka, and since then has acquired work experiences in journalism, tourist management, and language translations. Urs Hirschberg (PhD, Local Curriculum development Coordinator, Teacher) is founding director of the Institute of Architecture and Media, dean of the Architecture Faculty and professor for representation of architecture and new media. He holds an architecture diploma and a doctorate of ETH Zurich where he has also taught. He is a founding editor of Graz Architecture Magazine and a council member of the European Association of Architectural Education. Daniela Brasil (PhD, MFA, Architect. Local Project Coordinator, Teacher) is an assistant professor at the Institute of Contemporary Art. She Holds a PhD and a MFA on public art from the Bauhaus-Universität Weimar. She has graduated in Architecture in Rio de Janeiro and has attended other postgraduate courses on art and urbanism in Lisbon and Oxford. Her practical and theoretical works focus mainly on collaborative artistic practices that contribute towards a participatory democracy. Brigitte Kovacs (MFA, MA Researcher, Teacher) is an assistant professor at the Institute of Contemporary Art. She graduated in Fine Arts at the University of Applied Arts Vienna in 2006, after having graduated in Art Education and German Philology in 2005. Specialized in contemporary performance practice, site-specific interventions and installations in the public space, she is working as both lecturer and visual artist with exhibitions in Austria and abroad. Richard Dank (MSc, Researcher, Teacher) is an assistant professor at the Institute of Architecture and Media. His main area of activity is interweaving art and architecture with/in the field of digital media - scientifically and in practice. Collaborating with several architects, artists and institutions worldwide his oeuvre oscillates between designing and design - from graphics and videos, over installations and web applications, to construction and building - with the focus on algorithmic and interactive projects on- and offline. Leonardo Quaresima (PhD, Local Coordinator, Curriculum development Coordinator, Teacher) is author of several publications and full professor of Cinema History and Criticism at the University of Udine and former president of the Gorizia DAMS Degree Program of the University of Udine. Alessandro Bordina (PhD, Researcher, Teacher) researches in: conservation, restoration and preservation of video art and media art. He is member of La Camera Ottica laboratory as videopreservation project manager and research assistant at the University of Udine, where he also worked in the digital preservation of videoart collection art/tapes/22 stored in Biennale of Venice’s archive. From 2009 he teaches Film and Video Restoration at the Accademia delle Belle Arti di Brera (Milan) and at the University of Udine. Federico Zecca (PhD, Researcher, Teacher) teaches Languages of Theatre at the University of Cagliari and has taught “Film and New Media Semiotics” at the University of Trieste. He is a member of the editorial staff of Cinéma&CIE: International Film Studies Journal and Cinergie: Il cinema e le altre arti. He has published in national and international journals and edited several books..
Dalibor Martinis (MFA, Local Project Coordinator, Curriculum coordinator, Teacher) taught New Media at The Applied Arts Academy, University of Rijeka until September 2012 and since remains an honorary member of the Adriart team. He is an acclaimed media artist and held numerous personal shows, performances and screenings, and participated in many international exhibitions (Biennales: São Paulo, Venice, Kwang-ju, Thessaloniki, Cairo; Dokumenta/Kassel, etc.) and film/video festivals (Berlin, Tokyo, Montreal, Locarno etc.). Who are we steered by? Bob Cotton is director of Visioneca - a festival of Experimental Film and Media. He is a trustee of the Julia Margaret Cameron Trust - a gallery and museum of the work of Julia Margaret Cameron. He is also a film-maker, writer and media historian. He teaches as Visiting Lecturer at Arts University College at Bournemouth and is Visiting Practitioner Professor at University of the West of England. Klemen Širok (PhD, External Quality Assurance) has been involved in preparing numerous research and applicative projects predominately in the field of evaluation studies and labour market. He was also member of the Management group of the TULIP Network, EC 'Impact Monitoring Working Group of the LLP Committee' and EC 'Expert Group on the Benchmark on Learning Mobility'. He was also a senior lecturer and researcher in the field of labour market, evaluation studies and human resource management at the University of Primorska - Faculty for Management Koper. Saša Nabergoj is head of “World of Art Programme”, a program aimed towards practical and theoretical education in the field of contemporary art curating and critical thinking. She is an art historian, curator and critic, Assistant director at SCCA, Center for Contemporary Arts – Ljubljana. She has been publishing texts, critics and essays on the contemporary art and culture in various Slovene and international art magazines and newspapers since 1995. She is a member of AICA (International Association of Art Critics). A member of editorial board of Maska, Performing Arts Journal. Since 2003 contributing editor of Praesens, magazine of contemporary art in central Europe. Reni Hofmüller is a DIY artist, musician, composer, performer, organizer and activist in the fields of usage of (new) media, technology and politics in general, engaged in development of contemporary art. 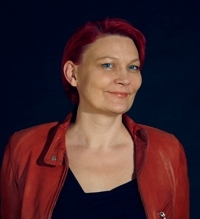 She is currently an Artistic Director of ESC im LABOR (founding member, 1993), member of the /etc (Eclectic Tech Carnival) since 1995, founding member of mur.at, a net art platform, established in 1998, a strategic alliance of art initiatives and artists of Graz and dedicated to creating an electronic network, board member from 1998 – 2003. Alessandra Lischi is Full Professor in Cinema, Television and Photography at the University of Pisa and Chairman of the Communication and Performance Arts courses, Faculty of Humanities. Shelectured around the world and wrote many texts, articles, essays, books about art and new technology, video-art, video and film experimental work and non-fiction production. She is also a documentary film director (diverse video portraits on artists, award at Locarno Festival 1999) as also co-director of the International Video Festival "Invideo" (Milano, Italy). Dan Oki is a visual artist and film author. His works are based on the process of researching personal, visual, and narrative contents, which demand various media forms and ways of their presentation. In the last few years he has focused his interest on feature-length film and cinematographic database in the context of the new media. From 1998 he teaches as a Professor in the field of Film and Electronic Arts at the University of Split Arts Academy (UMAS), where he also coordinated development of new BA and MA curriculums in the field. Valerija Zabret (aka Valerie Wolf Gang) is a freelance film-maker and photographer from Slovenia. Although still a BA student at the School of arts, University of Nova Gorica, her photos have been published in different magazines and some of her short videos were nominated as best independent films. International cooperations are always present in her life and she loves to work on different projects involving digital media and visual arts. Beside fiction she also enjoys making documentary films. Ivan Vranjić is is a freelance photographer as also a graphic and web designer. He is an MA student at the Academy of Applied Arts in Rijeka (APU), where he also earned his BA and works also as student assistant. He exhibited mainly in Croatia, but also in Germany and the UK. He is recipient of DAAD (Deutscher Akademischer Austauschdienst) scholarship, Academy award (APU), and a HDD (Croatian Designer Society) award. Leonardo Quaresima from the project Management Board. For bio-note see above. Urs Hirschberg from the project Management Board. For bio-note see above. Dalibor Martinis from the project Management Board. For bio-note see above. Rene Rusjan from the project Management Board. For bio-note see above.